The last week of August is already here, and art is more than ever in the air. Where to go? What to see? Get your walking shoes ready because it looks like Thursday evening is going to be an arty marathon. The oh so cool South Tel Aviv Art Gallery is going to host the first solo exhibition of Christian Kraemer aka Dome in the holy land. It’s the second show that this new gallery is presenting, and I bet that it will be as refreshing and successful than the ShinLamed exhibit. Dome is a German street artist graduated in Visual Communication from the Art Academy in Mainz. He discovered spray painting in the mid nineties and decided to explore this medium. Since that he extended his technic to other media such as ink, cardboard, paper, collage, canvas but didn’t abandoned the idea of working on walls and concrete. Dome art is full of strange creatures, humans wearing animals masks (or head) standing up in surrealistic landscape or interior, there is almost something magical. Music is also very present in his work, his characters are often playing various instruments. We are looking forward to discover the curating choices of the art gallery and of course the artworks of the artist. This week the Sommer Contemporary Art Gallery is going to host a very important art event in Tel Aviv : The opening of Ugo Rondinone solo exhibition Primal. The Swiss artist is a major figure of the contemporary art world, and has spent the last twenty years examining the psychic and emotional nature of the banality of human existence. The artist experiments with an array of media and his vast body of work includes sculpture, trance-like mandala paintings, large scale drawings and multi-channel video installations. The exhibition will present a group of thirty unique bronze-cast horse sculptures, continuing Rondinone’s preoccupation with archetypical images taken both from classical art history and primitive art. 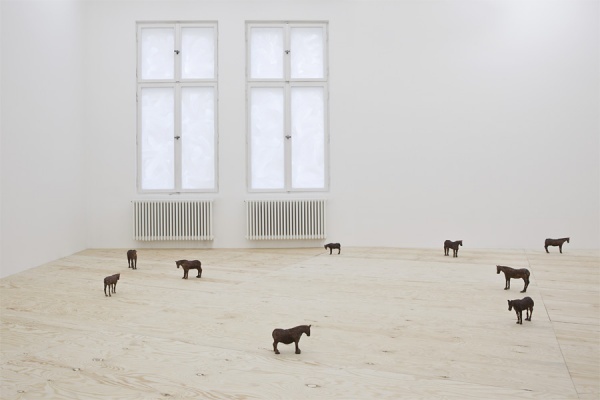 The gallery space will be transformed by plywood flooring covering the entire exhibition, and the horses scattered around in it. Ori Gersht is an Israeli fine art photographer and a professor of photography. He is probably one of the most successful Israeli artists working today. He has exhibited his work at the Tate Modern and the Victoria & Albert Museum, London; The Museum of Fine Arts, Boston; The Museum of Contemporary Art, San-Francisco, amongst others. He is going to held in Tel Aviv a “double” exhibition as some of his new works are going to be show at the Noga Gallery for Contemporary Art and some at the Center for Contemporary Art in Tel Aviv. At the Noga Gallery, Ori Gersht will premier in Israel a new body of work consisting of three collections of photographs titled: Offering, Love Me Love Me Not and Cells, as well as a HD film titled Liquid Assets. While at the CCA , the artist will present : “The First to Laugh” depicts Israeli Jewish, Christian, and Muslim children playing a game known as “First to Laugh, “Offering” presents a cycle that begins with an intimate depiction of a matador being dressed for a bull fight by his armor bearer, and “Will You Dance For Me?” begins with a tight motionless close-up of a very old woman sitting in a rocking chair. The figure is in fact Judith Arnon, an important dancer and choreographer. Note that Ori Gersht will be at the CCA on August 30 AT 12 pm for a artist talk. hmmmm çà va décoiffer ce week-end !!! !